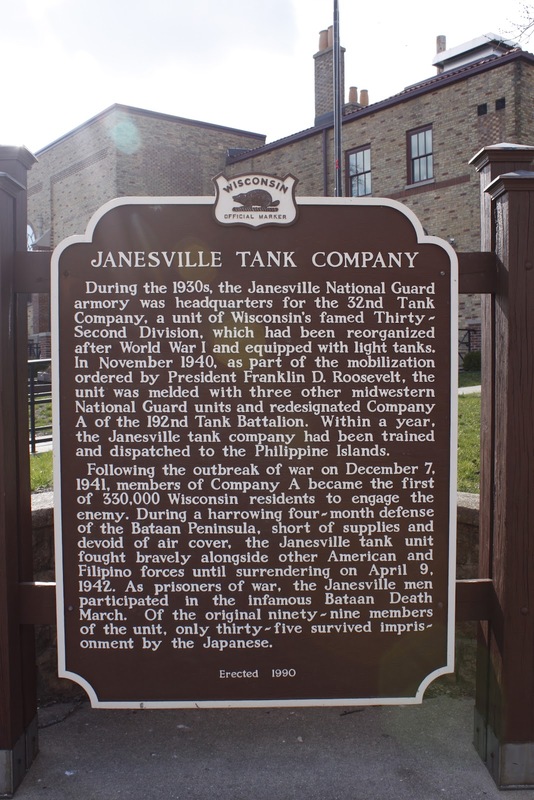 During the 1930s, the Janesville National Guard armory was headquarters for the 32nd Tank Company, a unit of Wisconsin's famed Thirty-Second Division, which had been reorganized after World War I and equipped with light tanks. In November 1940, as part of the mobilization ordered by President Franklin D. Roosevelt, the unit was melded with three other midwestern National Guard units and redesignated Company A of the 192nd Tank Batallion. 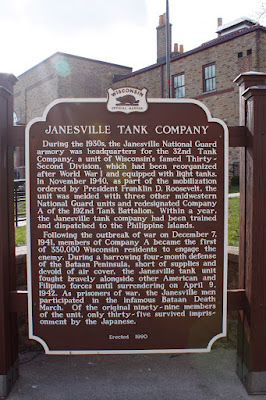 Within a year, the Janesville tank company had been trained and dispatched to the Philippine Islands. 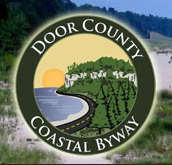 Following the outbreak of war on December 7, 1941, members of Company A became the first of 330,000 Wisconsin residents to engage the enemy. During a harrowing four-month defense of the Bataan Peninsula, short of supplies and devoid of air cover, the Janesville tank unit fought bravely alongside other American and Filipino forces until surrendering on April 9, 1942. As prisoners of war, the Janesville men participated in the infamous Bataan Death March. Of the original ninety-nine members of the unit, only thirty-five survived imprisonment by the Japanese. The marker is located on southbound South High Street, at its intersection with Dodge Street, at 10 South High Street, Janesville, Wisconsin 53548. 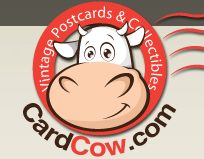 This property is now occupied by The Armory Restaurant. There are several markers in Wisconsin honoring the U.S. 32nd Division. Use the "U.S. 32nd Division" label below to create a list of these markers.